Confession: I let out a yelp of joy every time I discover that VH1, E!, or even ESPN is airing a countdown program. A TV show could pretty much count down anything — even something awful, like “20 Most Boring Textbooks” — and I’d still be completely hooked until I found out what made the number one spot. That’s why I’ve got another countdown for you guys this week. Two weeks ago we covered the Top 10 Most Stylish Male Athletes, and last week we discussed the Top 10 Most Stylish Female Athletes. This week, with all the buzz going around about the royal baby, I thought it would be fun to shake it up and cover a subject a little more…pint-sized. That’s right, girls: this week we’re going to examine the Top 10 Most Stylish Celebrity Children. Some of these kids are still in elementary school — and okay, some of them can barely speak at their age. But, that doesn’t mean that they’re don’t already have signature looks and we all can admire. Let’s get right to checking them out! Something I totally love about Ben Affleck and Jennifer Garner is how, well, normal they seem. Sure, they’re both beautiful, crazy talented, and have healthy bank accounts. However, they also both do things like go to the grocery store in sweatpants, take their kids to school in hipster glasses, and sneak kisses in between teaching their kids how to ride bikes. They’re definitely two of the most hands-on Hollywood parents I’ve ever seen! It’s no wonder that their eldest daughter Violet Affleck seems happy, healthy, and playful in every photo we see of her. In tie-dye and floral prints, loose-cut tunics and dresses, patterned leggings, brightly-colored footwear, and funky glasses, Violet looks like any wacky and adventurous kid you’d meet in America. Violet’s not afraid to wear several colors at the same time or mix patterns and prints. I would compare her eccentric ensemble and affinity for bright colors to an early Katy Perry. Violet’s fun and quirky style is an inspiration for all you other crazy kids out there. A few years ago, when the bohemian crazy swept our country, you could trace almost every trend to back to socialite and reality star Nicole Richie. Now married to punk-pop star Joel Madden, Nicole is the proud momma of two adorable kids. She also founded a crazy-popular fashion accessory line called House of Harlow 1960. Her daughter, the company’s namesake, happens to be number nine on our countdown. In floppy sunhats, peasant tops, ruffles, muted floral prints, and a mess of dark-blonde curls, Harlow Madden looks every bit as stylish and boho-chic and her momma. Harlow looks earthy and beautiful in sandals, easy slip-on dresses, flower and sequined headbands, and a great pair of sunglasses. The way Harlow dresses seems to channel, well — a pint-sized version of her mom! Something tells me that Harlow will also be the first girl in her class to carry an oversized hobo bag, try a maxi skirt, and rock a hippie headband. Borrowing hipster-chic sensibilities from her parents Michelle Williams and the late Heath Ledger, Matilda Ledger never goes anywhere without looking ridiculously cool. You can tell that Matilda’s style is very influenced by New York City. She is always seen wearing layers, and is often dressed in leggings, boots, and a jacket. Matilda is often spotted wearing heavy materials like wool, denim, and canvas. She’s a fan of headwear, and usually rocks a beanie or headband with her outfits. Another one of Matilda’s staples is a colorful and weather-apprpriate pair of rain or snow boots. Don’t mistake Matilda’s utilitarian wardrobe as a lack of creativity, though — she’s also known to mix it up sometimes and sport a bold costume, even to events that don’t require a disguise! Michelle Williams is never afraid to take huge risks on the red carpet, and it appears as though Matilda will be following in her footsteps. When your mom is celebrity stylist Rachel Zoe, a great sense of style is pretty much in your genes and jeans. And yes, I’m aware of how cheesy that pun was. Everyone’s favorite celebrity stylist dresses her son Skyler Berman in boho staples, like loose cuffed jeans, slip-on shoes, and lightweight, blouse-y tops. He’s only been around on earth a short while, but it seems as though Skyler already has a signature piece that completes each of his outfits — a fantastic hat. From fedoras to beanies, newsboys to floppy bucket hats, Skyler appears to have more headwear than Jack White and Johnny Depp — combined! Although there’s probably a chance Skyler ditches the hat within a couple years (come on…hats, no matter how cool they may look, aren’t exactly conducive to playing freeze tag on the kindergarten playground), there’s no question that he’s currently one of the best-dressed babies the modern world has ever seen. Brad Pitt and Angelina Jolie might as well be the king and queen of Hollywood (and in my opinion, maybe even the entire world). They’re arguably the two most beautiful people in universe, but instead of sitting at home staring at themselves in the mirror (which, uh, we would all probably do if we were them), they fly all around the world adopting children and helping humanitarian causes. Can we just go ahead and nominate both of them for sainthood? Brad and Angelina’s daughter Shiloh Jolie-Pitt is known in Hollywood circles as the face of young androgyny. 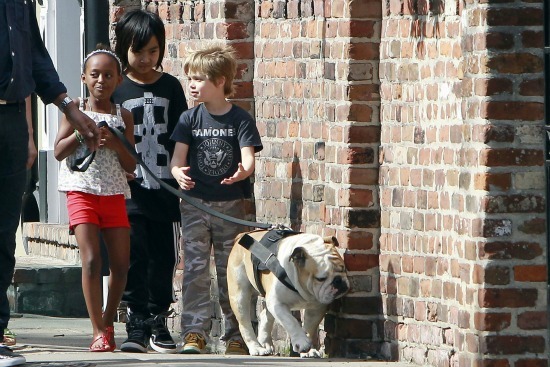 According to an interview with Angelina, Shiloh looks up to her brothers and loves to wear their hand-me-downs. She’s known to rock ties, blazers, sneakers, track suits, camouflage print, tough boots, and graphic t-shirts. Shiloh is also no stranger to dressing up in costumes — most notably a stinking’ adorable toy soldier ensemble. Shiloh’s tousled haircut also lends itself to her whole adventurous, fun, tomboy motif. I look forward to seeing what this little firecracker wears to red carpet events in the future! It’s no surprise that the eldest child of Gwen Stefani and Gavin Rossdale would be as badass and rock ‘n’ roll as they are. With funky hairstyles and a devil-may-care attitude to boot, Kingston Rossdale makes the number five spot on our list. Kingston has been seen about town rocking pretty much every single color, texture, and pattern under the sun. Kingston likes to mix prints, wear casual pieces with otherwise formal outfits, and break almost every fashion “rule” you’ve ever heard before. As seen in the above left picture, Kingston’s even brave enough to rock the occasional statement necklace! It’s clear that he takes a lot of style cues from his hot mama, but Kingston’s style also has hints of punky British style like Pete Doherty and outrageous funk, a la Redfoo from LMFAO. Talk about eccentric! Shiloh is a young pioneer in the realm of rocking menswear, but her older sister Zahara Jolie-Pitt is the complete opposite. Zahara’s parents are Hollywood royalty, and her sophisticated, elegant, and insanely girly wardrobe is fit for a princess. Z is known to travel the world with her family in ruffled dresses, leggings, jelly sandals, flower headpieces, and fantastic handbags. Even in cool climates, Zahara looks stylish and chic in classic trenchcoats or wooly peacoats. Zahara’s also into rocking both understated and bold jewelry, sleek hairstyles, and even the occasional pair of kitten heels. Hand-me-downs? Yeah, right! The you can tell that the eldest daughter of Brad and Angelina wants nothing to do with Maddox and Pax’s outgrown t-shirts or dirty jeans. Our girl Z is like a young Kate Middleton or Michelle Obama — classic and sophisticated, without looking stuffy. Let’s be clear — Scott Disick is by far my favorite Kardashian. He’s hilarious, dresses to kill, and quotes Home Alone in everyday life. He’s pretty much the real life version of Patrick Bateman in American Psycho…you know, except the whole serial killer part. Twisted as this may be, I was ecstatic to find out that Scott and Kourtney were pregnant because that meant he’d be upgraded to a main character on Keeping Up With The Kardashians! 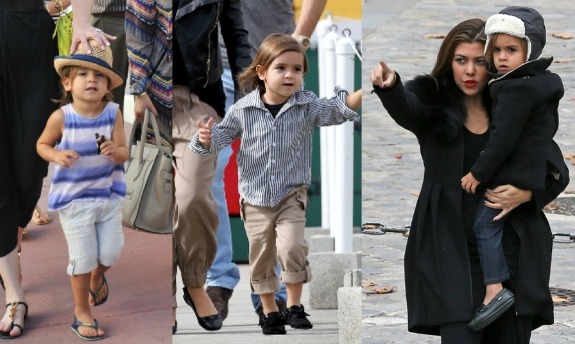 To no one’s surprise, Mason Disick is one of the most stinkin’ cute things I’ve ever seen in my entire life. Instead of following in his dad’s very pastel, preppy, Hamptons-esque signature style, Mason’s blazed his own trail and turned to California casual pieces instead to fill out his closet. Mason’s long haircut complements his penchant for man-capris, sandals, tank tops, and fedoras. This laid-back, beachy-hipster style contrasts the rest of his family’s more glamorous looks. His style sort of reminds me of a little version of Zac Efron or the members of One Direction. If Brad and Angelina are the king and queen of Hollywood, Will and Jada Smith are the duke and duchess. Every movie Will Smith touches turns to gold, and it’s apparent that he passed his talent down to his children. Jayden and Willow haven’t even hit high school yet, and they’re both already juggernauts in the film and music scene. Jayden always looks urban and suave in his bow ties, cargo pants, and jackets, but his little sister Willow Smith is the one who makes the number two spot on our list. Ever since Willow was young, Jada has taken her to haute couture fashion shows in New York, LA, and even in Europe. It’s no wonder that Willow is now completely fearless on the red carpet. Willow’s been seen rocking everything from bold animal prints to crazy platform heels, unique hair styles, cut-out dresses, and loud jewelry. Willow reminds me of an adolescent Nicki Minaj, or Lady Gaga — she’s 100% willing to wear anything that makes a statement. Willow is already a staple on E!’s Fashion Police and every magazine’s “best dressed” lists. That’s quite an accomplishment for someone who’s too young to even have a learner’s permit! To say I’m a fan of this kid is a gross underestimate. Suri Cruise, daughter of Tom Cruise and Katie Holmes, might just be the single most fantastic thing roaming the streets of New York City since the Club Kids of the ’90s. With A-list parents, a precious little face, and a hilarious parody blog, being Suri Cruise seems like a pretty sweet gig. First of all, Suri is the epitome of luxurious, glamorous, girly style. I don’t think I’ve ever seen her in a pair of pants! Suri’s signature dresses and skirts are usually made from girly fabrics like chiffon, silk, or tulle. She also digs dresses that are the color pink, floral printed, or have A-line silhouettes. Having a reliable fashion motif is a great way to develop personal style — it gives you a constant to build your entire ensemble around. Secondly, Suri’s all about the accessories. She never leaves the house without a purse — a cardinal rule that I absolutely live by as well. Suri’s often seen about town dressed to the nines in scarves, statement necklaces, earrings, and headbands. She understands that an outfit isn’t complete without a few fun extras. Lastly, Suri’s ability to dress like a “little woman” completely amazes me. She isn’t even in third grade, and she can already pull off fur coats, pearls, red lipstick, and high heels better than most of us. You read that correctly — Suri Cruise, a child who barely clears four feet tall, can rock the heck out of a pair of pumps, and do so without tripping. Whenever I wear spiked heels, I’m pretty sure I wobble around like a baby giraffe cartoon. If that’s not totally inspirational, I don’t know what is! The juxtaposition of her youth combined with sartorial pieces that some consider to be “granny-esque” is interesting — and totally exquisite. Are these kiddos cute or what? Do you pay attention to any of your favorite celebrity’s children? Which one is your favorite? Who did we leave off? What other lists would you like to see CF write? Leave a comment and contribute to the convo!